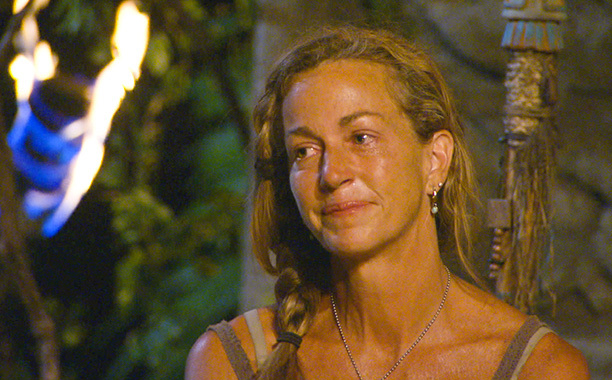 I know most of you aren’t reality tv/survivor fans but I am and wrote this post on my other blog about gender stereotypes on the show and our society- particularly relating to mothering roles. It’s about TV and media so I thought some of you might be interested. This made me laugh. (And I remind you I loved Tangled. It’s #4 on my ranking) . 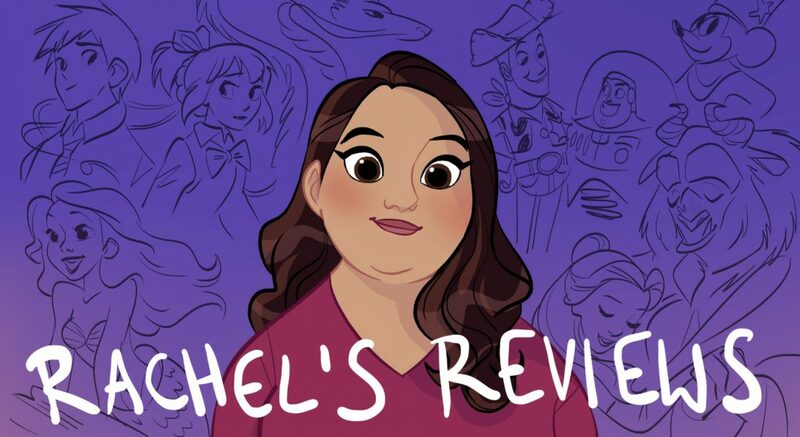 The birthday thing is a huge plothole with Tangled and how did Gothel know the song and how to use the flower? Those are big problems but I don’t care. Still I thought this was funny. The Maleficent one was also very funny. Frozen one but I didn’t think it was that clever. That’s why I really don’t give much credence to the plothole arguments . All movies have them. All stories do but you go with it and enjoy the experience (or not). It’s all about whether you can accept the director and writers vision or not. Plotholes really don’t matter except in bad movies. 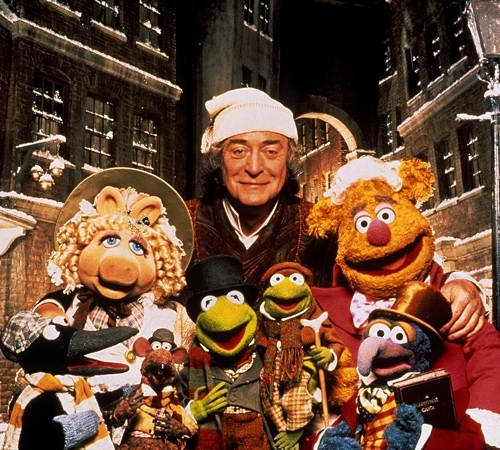 I posted the last of my Scrooge month reviews a few hours ago with the review of The Muppets Christmas Carol. And I just wanted to share with all of you what a wonderful experience it has been. Have I seen a few clunkers? Yes, but not many and even less successful adaptations still had parts I liked (only 2 I really hated). I think it says something to the power of what Charles Dickens created that I could watch the same story 30 times and still get choked up today on watch 30. There’s a reason it was a massive hit in Victorian England and has never gone out of print. There is a reason it turned Christmas into the holiday it now is . There is a reason it has been tackled by everyone from Mickey to Alistair Sim. I believe the reason is it is a story about hope. We all want to believe in the goodness of our fellow humans but sometimes it can seem hard to see. 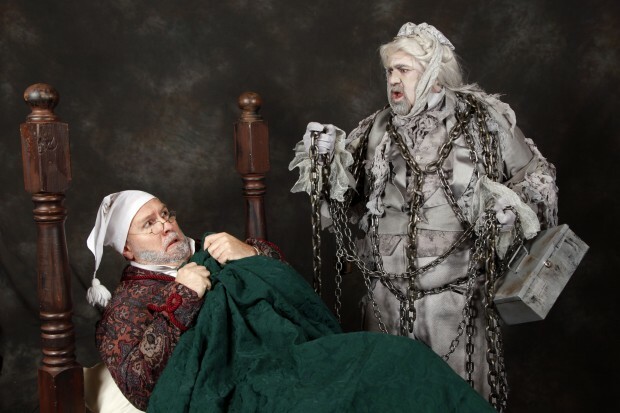 Christmas Carol tells us that even the worst have hope and the ability to change. Being a Christian I love the idea of conversion, which comes with recognizing hope, but even if you do not believe in Christ the desire to change within ourselves is sometimes hard to find. It can feel overwhelming when hate and bitterness overtake our souls, and we cannot forgive others for hurts that feel Goliath in size. 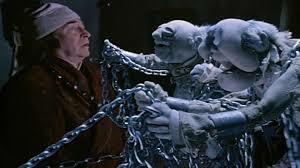 There is something about Scrooge’s story that gives us hope that we can change even if others seemingly cannot. In a world that grows increasingly cynical by the moment it has been heartening to spend this Christmas season focused on hope and I thank you all for allowing me to prattle on and read my silly thoughts. It means a lot to me and has been a wonderful holiday I will always treasure. It has also been a ton of fun. In some ways it’s like a whole classroom was given the same writing exercise and in the end produced wildly different responses. I’ve had the chance to review franchises I was not as familiar with like Flintstones, Barbie, Smurfs, Looney Tunes and even the BlackAdder. I had the wonderful adventure of exploring silent films, something I do not do nearly enough. I watched cheesy made for TV movies and giggled at the hokiness and camp value. And I rediscovered versions like Patrick Stewart and the Disney version were even better than I remembered. After spending November writing a novel it has been a wonderful experience to see so many takes on someone else’s creation. So people will probably want to know what are my favorites? (I’ve grown weary of late of making lists). Honestly I don’t have a favorite. Alistair Sim 1951 is probably the most well made and acted, but they all have their own unique appeal. So I would just challenge you to look at the reviews themselves and see what strikes your fancy. Aside from Ghost of Girlfriends Past and All Dogs Go to Heaven Christmas Carol, you’ll have a good time at the movies and be reminded of the hope of Christmas. And like Tiny Tim says God Bless Us Everyone! Merry Christmas Friends! 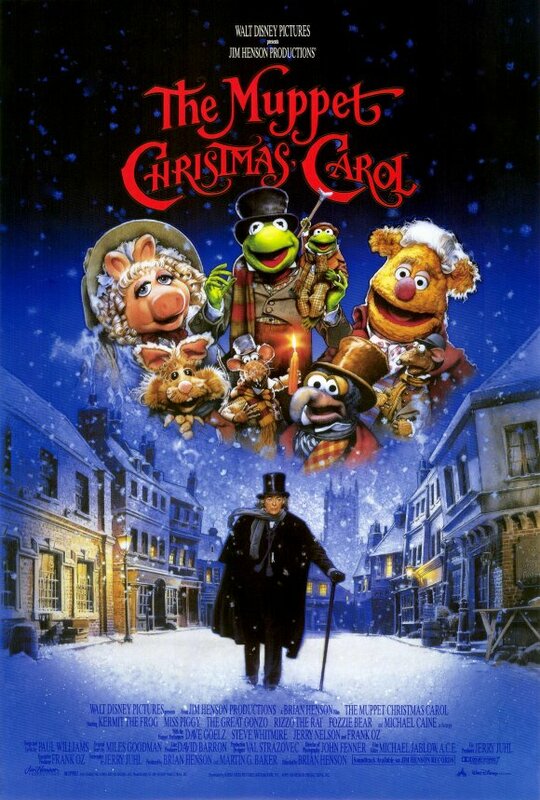 I was planning on waiting till Christmas Eve to review the Muppet’s Christmas Carol because my family and I will often watch it on Christmas Eve. But I finished earlier than I expected and this is my last Scrooge review and we are ending with a real winner. 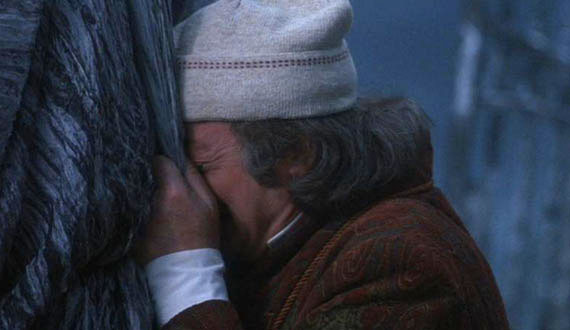 I am well aware that readers of this blog do not share my attachment to Muppet Christmas Carol and I respect their opinion but it has no effect on mine . I love this version and it battles Alistair Sims and George C Scott as my favorite. Am I blinded by nostalgia? I don’t think so. I do love The Muppets. They are so cheerful it is hard for me to imagine people not liking them. To me it is like Looney Tunes, Winnie the Pooh or Mickey and Friends they are a part of my childhood but the writing and joy in the stories transcend childishness and become entertainment for all. 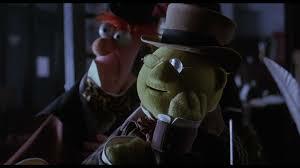 That said, I certainly do not give Muppets a free pass in all their films. The writing has to be there just like with any other artform or entertainment franchise. 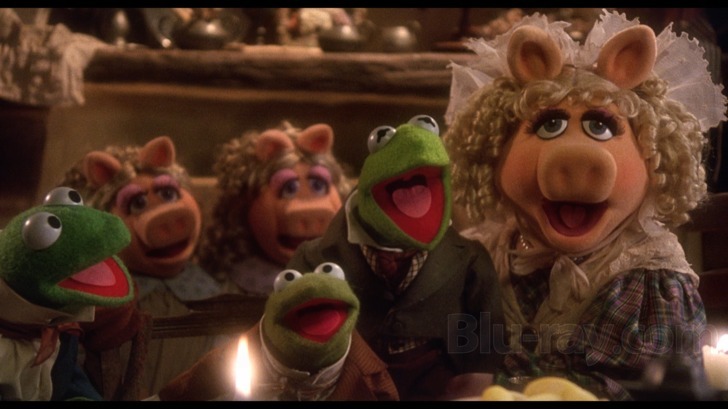 In fact, this year I included Muppets Most Wanted on my worst of the year list. 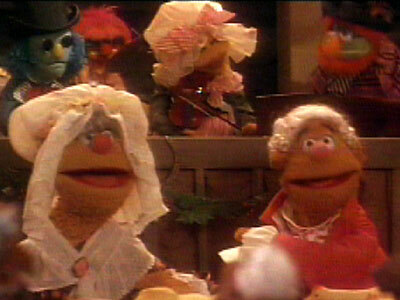 The Great Muppet Caper is another less successful entry in the Muppet world. The key to making a Muppets movie work (or most any film for families) is the human characters, the grownups, have to play it completely straight like they would if they were acting with any other human actors. When Steve Martin acts with Kermit and Miss Piggy in the original Muppet Movie he plays it just the same as he would if it was Chevy Chase and Jane Curtain. 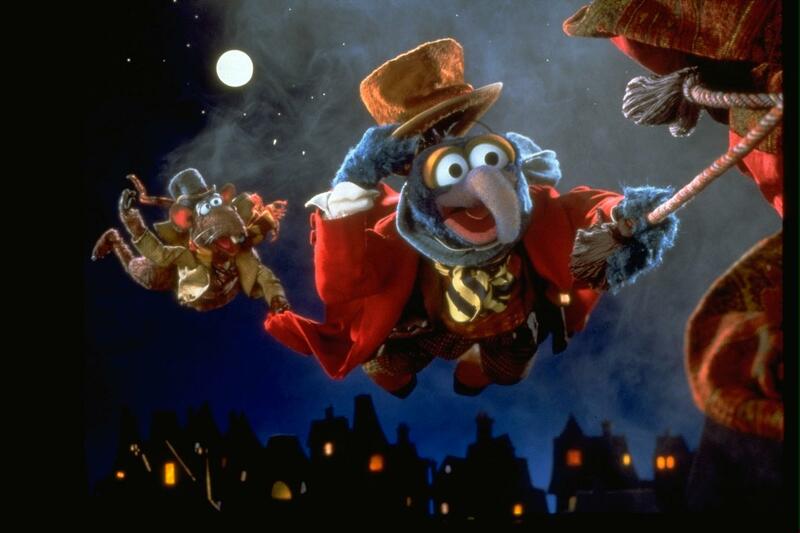 Muppet Christmas Carol is the best example of playing it straight. Michael Caine does not change his performance an inch because he is acting with Muppets. I love his version of Scrooge. When he yells at the bookkeepers or throws cute little Beaker and Bunson out as the Benefactors there is no acknowledgement of their cuteness. He is as Gonzo’s Dickens says ‘a covetous old sinner’. Gonzo and Rizzo are our narrators and Gonzo is Dickens and so we get a ton of the actual text for a kids version, and the story plays pretty close to the cuff compared to other adaptations. I think that’s great for kids to hear the old English and at the end they invite the children to read the book. They also provide much of the humor in the story to help temper the scarier moments for kids. Like when Gonzo lights Rizzo’s tail and he says ‘light the lamp, not the rat”. I don’t know a kid that wouldn’t laugh at that (and me too!). 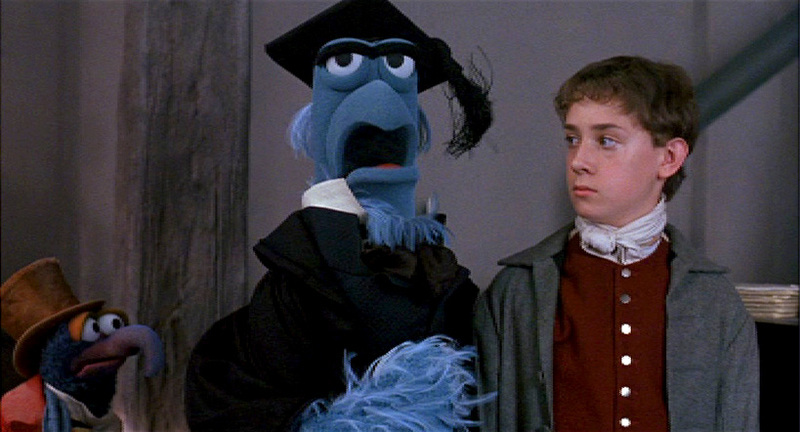 I’m also a big fan of Muppet Treasure Island which cast a brilliant Tim Curry who can ham it up more as a pirate than Caine’s Scrooge but I think both are strong at teaching kids about a classic piece of English literature in an approachable and fun way. 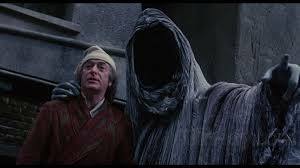 Scrooge- As I already said I love Michael Caine as Scrooge. I think he is tough but I love how we actually see Scrooge cry and early on too. When he see’s his young self studying alone he cries. When he see’s Belle he is visibly hurt. 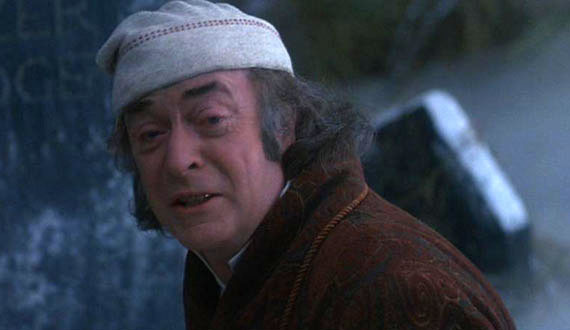 He is one of the most vulnerable Scrooge’s on film and I love that! 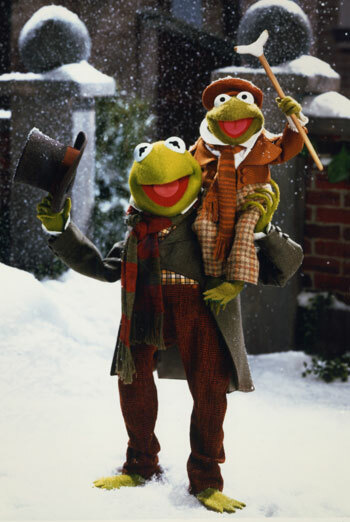 When he see’s Tiny Tim he says ‘a remarkable child’ and it feels sincere even though it is a frog puppet. I actually feel it is one of the better Scrooge/Tim relationships. 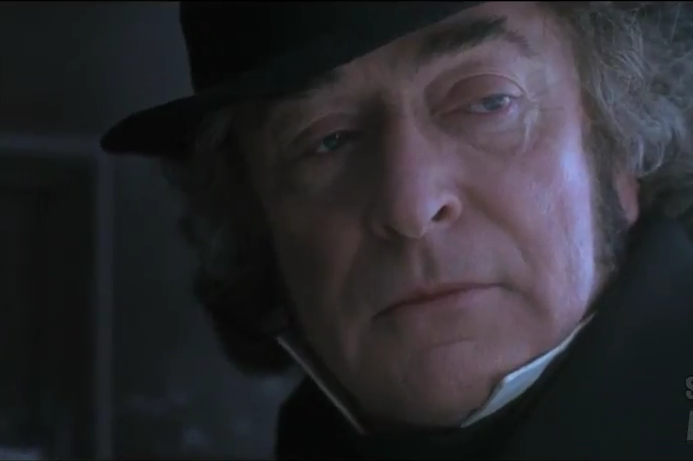 See the warmth in Scrooge’s eyes and this is at the very beginning of his journey. Sometimes the transformation happens too late. We don’t see any growth or tenderness until the 3rd ghost. Not so in this version. The songs do a great job telling the story instead of stopping it which many versions do incorrectly. Like our introduction to Scrooge tells us everything we need to know and provides a few laughs along the way. 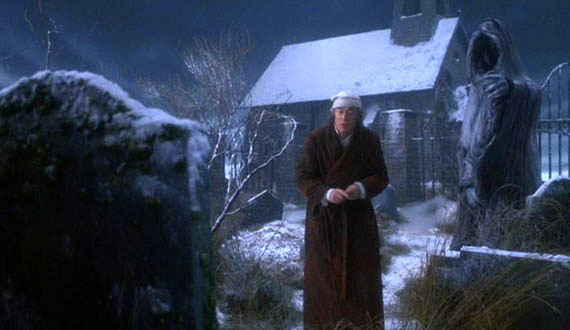 To me the song Scrooge is kind of like Belle from Beauty and the Beast. Both songs are a character going through town and people telling us who they are what the story is. In contrast think of I Hate People in the Finney version tells us Scrooge hates people after we’ve already established that. The song is completely unnecessary; whereas, the one’s from Muppets tell the story. Aside from the basic difference of being Muppets as the characters it does stay pretty close to the book. The Paul Williams songs and Miles Goodman score are just lovely. I have them on my rotation of Christmas Carols and definitely think they are the best Christmas Carol musical efforts. It’s such a warm and happy song. Really spells Christmas out for me. Another difference is instead of one Marley they have 2 brothers- Jacob and Robert Marley. This is so the curmudgeons Statler and Waldorf could play them and it is all done very well. I love the way they mock Scrooge, taunt and heckle him. That’s so S and W and feels like something 2 Marley’s might have done. Again Caine plays the scene as if he was working with any human actors and it works very well. I love the singing cashboxes! They take us to see Scrooge growing up and we get a good joke from Sam the Eagle. 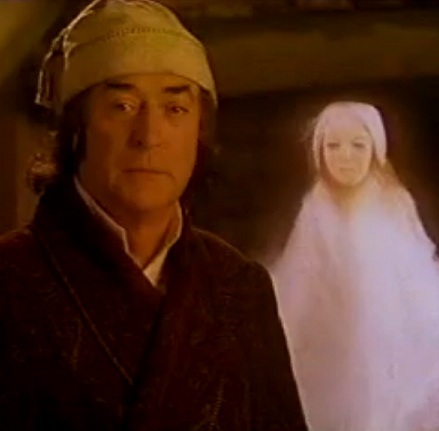 But we don’t get a Scrooge and Fan scene which is a shame because I think Caine would have been great with that. Then we move on to Mr Fozziwigs who is of course Fozzie and they work in a lot of the other characters in the party scene. 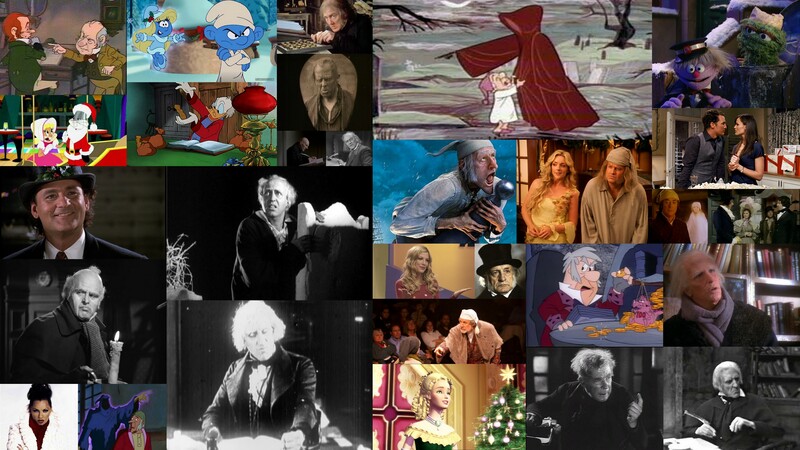 We then finish off Past with Belle and Scrooge. Present is one of my favorites with a unique Muppet who is one of the few Presents to actually age. He and Scrooge have a real bond. It feels genuine when Caine says “I have learned so much from you. You have meant so much to me. You have changed me” I love that example of friendship. So many versions the townspeople and even Present can be kind of judgy and mean but here they were all aching to be friends with Scrooge. We get another great song from Present. And the interactions at Fred’s and at Cratchit’s feel like real families, not silly puppets. I love that the girls are pigs and the boys are frogs. That was very clever. 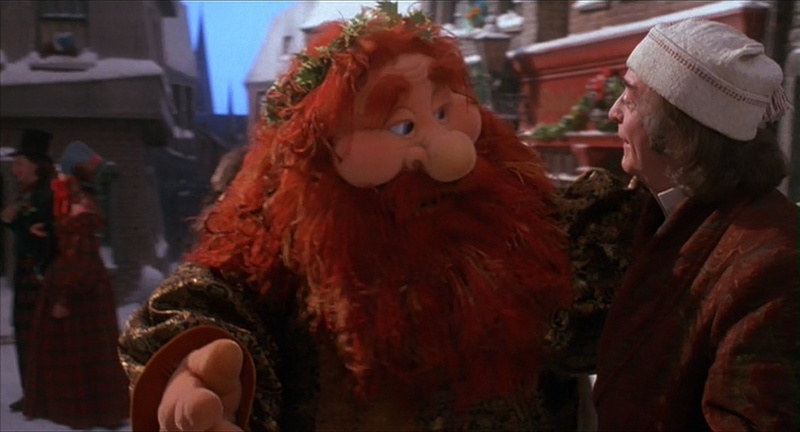 Tim sings a syrupy but nice Christmas song for the God Bless Everyone line and again Scrooge seems very moved by it. Rizzo is also very funny in these scenes with some good slapstick. We then get a pretty classic Future. I really liked how they did the Pawn Shop scene with Old Joe as a spider. That was very creative. The other businessmen were pigs which I thought was a funny inside joke and then we see the Cratchit’s mourning over Tim and again Scrooge seems very upset by it. He pleads with Future “Oh spirit must there be a Christmas that brings this awful scene. How can we endure it”. That’s a lovely heartfelt moment. Makes me tear up. Rizzo and Gonzo (Dickens) bow out for ending which helps it remain the serious tone it should. It is one of my favorite if a bit subtle Crazy Scrooge. The Bean Bunny Scrooge throws out for singing is the boy in the window which is sweet because when he is at Present you see him shivering huddled with newspaper. Then he meets up with Beaker and Bunson and Beaker gives Scrooge his first Christmas present a scarf and we get our final song. A lot of people are critical of Caine’s singing in this song but I don’t know I think he’s fine. Weaknesses- Honestly I love this movie so I don’t think much is wrong with it. I really don’t. I guess if people want a by the book version than the humor might annoy you but I like it. Some of the special effects are lame when Scrooge is going from one world to another or flying. To me this does what you want a family movie to do. It is warm, funny, sweet, good songs and a few scares. Plus, it introduces kids to classic literature by using lots of the text and being pretty faithful to the narrative. It doesn’t dumb it down for kids. I guess people that just don’t like the Muppets even at their best don’t like it but I try to be open minded to all styles and forms of movies. I know people who just don’t like anime no matter how brilliant and creative it might be and I think that’s a shame. If the humor and style doesn’t work for you than so be it but I love it. Tonight’s review is a little different. 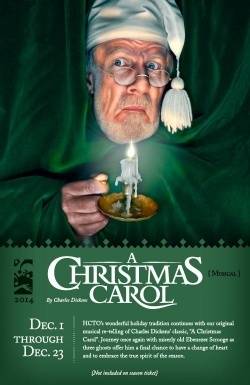 I want to profile not a movie but my local theaters production of Christmas Carol. In Utah and Arizona there are 3 independently owned theaters under the Hale name- Hale Center Theater Orem and Hale Center Theater West Valley are close to me. 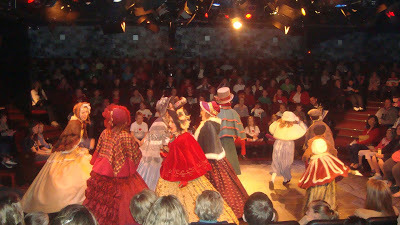 They are special theaters with Broadway level productions at reasonable costs and they are both theater in the round. This is such a great way to see a play because wherever you sit you have a good view. 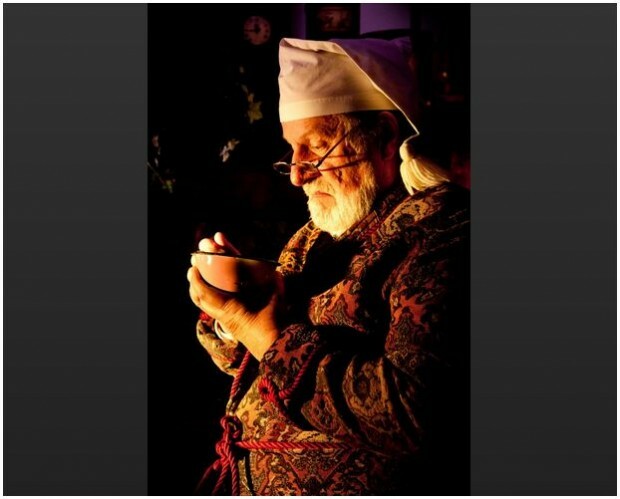 At Hale Orem the man playing Scrooge, Chris Brower, has been doing every performance for 20 years and naturally he has it down to an art. It is better than any of the film versions but is probably most like the George C. Scott with his Scrooge having a sarcastic twinkle. It’s a pretty amazing sacrifice that he gives the community every year because they have 2 to 3 performances every day and he is in all of them. He is funny and endearing and harsh. A great Scrooge. 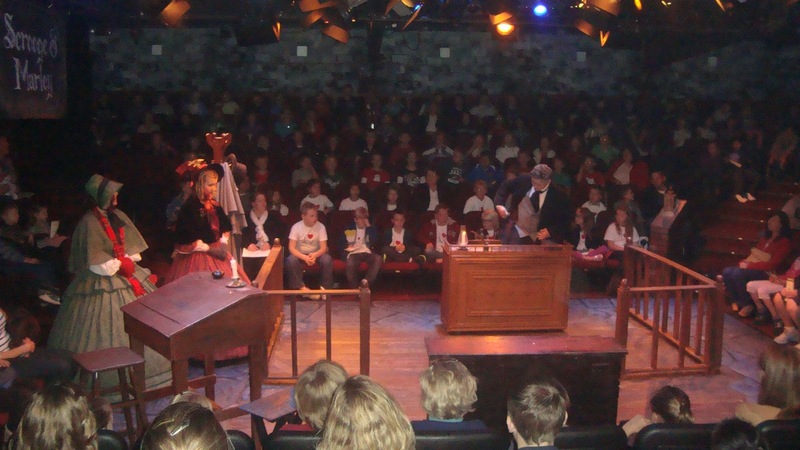 The Bob Cratchit this year played by musical director Cam Cahoon was great with a terrific singing voice. They always get the cutest Tim for these performances too. The Marley, played by Scott Healey has been in the cast the last few years I’ve seen it and he is very good. Here’s a little clip that might give you a feel for the production. This version is adapted by Hale family member Cody Hale and it is a solid adaptation although the original songs (only 3 of them) I could do without. Something about original songs and Christmas Carol I’m not that into. That said, I’ve certainly heard worse songs this month! The carols help to highlight the religious elements of the story, which I always appreciate and find most moving. In the end, it is the story of redemption, overcoming fear and isolation and the power of Atonement in our lives and communities. I never seem to tire of it even after 30 versions in a month. As much as I love movies there is something special about live theater that I will always love. There’s a rawness to live performance that excites and thrills me whether it is a concert, play, or musical I just love it! I’m so grateful to live in Utah where Hale theaters are one of many quality ways to experience the arts at good prices and with family friendly values. I would challenge all of you to seek out the arts in your area and support them as much as you can. It’s an important part of our community and makes our cities and towns nicer places to live. Hurray for the arts!!! This is some fan reaction to Hale Theater Arizona version but the feedback would be similar in Orem. I told you I would reblog a review that liked Maleficent as some of you did. I did not. In fact it’s my least favorite movie of 2014. My blogging friend Forrest Hartman gives it 3 of 4 stars.